Do you know what hides under your bed at night, or what lurks around when you stumble through the dark? Do you know what waits for you to step on to the ground to take you away? No, you don’t know what lives in the darkness. “They live under your bed at night and wait for you to fall asleep. Then they make their move. If you scream they get more powerful and if you don’t and just cry or be brave they take you too. And you never know they’re coming,” Dad tells me as I hide under my bedcover, now afraid of the night. I only peer my head out to look at a picture next to my bed of my little brother Sam who went missing a couple of years ago ‘I miss you so much Sam please come back’ I think to myself. Dad gets up and turns out the light. “Good night monkey,” he says as he turns and walks away. I try my hardest to fall asleep, but I can’t stop thinking about the monsters. Finally, I do get to sleep, but I’m woken suddenly when I hear the noise of my door creaking shut. I peer into the darkness and see a black figure that stands tall in the ray of moon light coming through my curtain. It lurks around my room. 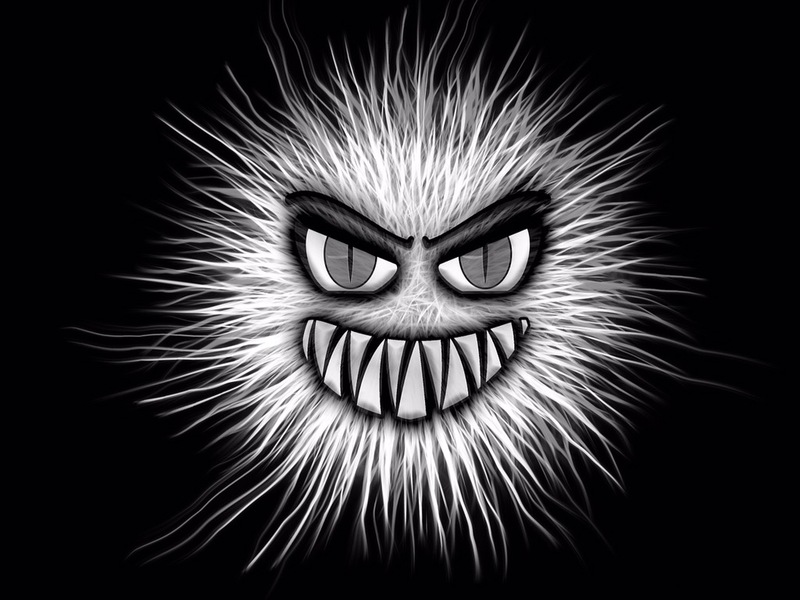 “Hello Mr Monster. Please don’t hurt me,” I say in fear. The figure turns and looks at me with big glowing red blood-shot eyes. It creeps up to me. I open my mouth but I don’t scream. The monster glares at me then sinks under my bed. My Dad runs in. “Hey what’s all the yelling for?” he says frantically as he turns the light on. “Hey it’s okay. You can come sleep with me and Mum,” he says protecting me with his hugs. I go into their room and straight under the covers. Mum comes out of the bathroom “Hey my little darling, what’s going on?” she asks. “She saw the monster that lives in the dark,” Dad says as he climbs into bed. “You told her that story why?” Mum asks as she pulls back the covers. She sounds cranky at him. We cuddle up together and fall asleep. I awaken to the first peeking rays of sunlight on my face. I sit up and look around to find my parent are gone. But how, they were there all night. Weren’t they? “Mum, Dad where are you? Please don’t hide, it’s not funny.” I gasp as I struggle to say anything at all. I hear footsteps and my heart races before my babysitter comes into the room, followed a moment later by my dog Bear. “Hey Lila are you okay?” Mandy asks as she sits on the end of the bed. I tell Mandy everything that happened the night before. “Your Mum and Dad got an emergency work call and had to leave straightaway but they’ll be at home when you get back from school. Okay?” She hugs me, but I still feel uneasy. I hadn’t even heard them leave. I go and get ready for school, then walk to the bus stop and hop on the bus. When I get to school my friends notice something is off about me. “What’s wrong?” they ask, but for some strange reason I can’t talk. I try, but nothing comes out. My lips won’t even open. They give me a snotty look and walk away. “Wait” I can finally speak but it’s too late, they are all angry with me. I run after them. I try to yell but it feels like my mouth is sewn shut. I get out my mirror and stare at the stitches binding my lips. Before I can even blink they disappear. I spend the rest of the day being shunned by my best friends. On the bus ride home it was like no one even knew I was there. Tired, I walk home from the bus stop. I am relieved to see that Mum and Dad are there but they did not say a word to me, or even turn to look at me. “Hey Mum, Dad are you okay? Have I done anything wrong? Please talk to me,” I say trying so hard to get their attention. They turn around slowly and their faces are blank. Their eyes are black — all black and they hiss at me. Then they start to speak, “You will surrender to the monster that lives in the dark. You will be taken. You will.” They speak in unison, while at the same time walking toward me. What has happened to my parents? I stagger back and shrink away. Before I can take another breath, their eyes go back to normal and they look at me curled up in the corner crying. “Hey monkey what’s wrong?” Dad says as he kneels down next me. “You should get some rest monkey,” my parents tell me. “Lila you will find out what lives in the darkness. You will become the darkness itself,” the voice says. I look around to find were the sound is coming from. “Your power. You have all the power. The darkness wants your power. You have more power than anyone can posess and we need it,” the shadow says. Then it walks away into the night. Before I could stop to think, I climb out the window and run after the monster. “What do you mean?” I shout. The monster turns and walks through a wall and out the other side. The darkness starts to run. It’s the sound of millions of giant footsteps. I look around to see millions of monsters coming from every house, running at the darkness that I have been following. The sounds of terrified children echo through the air. I remember something. The more the kids scream, the more powerful the darkness gets. That’s why they want me; I never scream in the face of fear. I follow the shadows as they run to a giant graveyard. They all suddenly stop. As I step closer they all turn to bow to me. I climb on top of the largest tombstone I can find; one that looked hundreds of years old, but strong enough to hold me. “You see my master we don’t want to hurt you, you know what great power you have and what you can do with your power,” says the monster that lives under my bed. I grin. “Sit,” I yell. “Well this will be fun,” I chuckle. I think to myself what can I do with all this power? The darkness disappears only to return with a staff as tall as me. “You are now the darkness. You are the queen of the dark. “Well what are you waiting for? Go scare the kids. Oh, and go get me the most terrified kid you can find,” I demand. I am finally powerful and have control over something. I can do anything I want. I can hurt anyone I want. I am what every kid fears. I am what lives under your bed ready to make my move. I am what lurks in the darkness. I return to my house and find my parent lying on the floor screaming. Standing over them is the monster that scared me. “Please monkey, help us. Save us from this thing,” my parents plead. I go outside and climb on to the roof and look over out at the city. “Isn’t that sound beautiful? You know, the sound of scared children” I say to darkness that is sitting next to me. “Not to be mean — your greatness — but don’t you think you are taking this too far,” he says tentatively. “No I am not,” I say. “But you know what would be fun? Catching those who have ever been mean to me, and giving them a taste of my power. “I say yes, but only because I am afraid of what you will do to me if I say no,” the darkness replies. We go door to door taking all those kids who were ever mean to me, and those who dared doubt I could do great things. We take them to my favourite spot — the cave off the beach. We hang them by chains to the ceiling. “Hey who has power now” I laugh as I poke them with my staff. “Why are you doing this Lila, what did we ever you do to you?” one of the girls cries. “Lila I know you’re still in there. This is not the real you. The darkness is just using you for your power. Please Lila come back to me. I am sorry I walked away from you!” My best friend Taya explains. A piece of me knows I have to fight the darkness. I have to fight the greed for this power. I have to beat it, but I love the power. “Never,” I say coldly. My voice doesn’t sound like mine. “Your friend is not here anymore it is only me, the black shadow now. There is nothing you can say to make her come back. She is lost somewhere in the dark. The feeling of the power is great I have to hide from nothing now. I can take over the world and put it into eternal darkness. Then no one will know what really lurks in to the dark. They will never know. Slowly but surely I will start to take over towns, cities, countries. But a small part of me knows this is not who I am. It knows who I really should be. I try to ignore it, but the feeling grows bigger inside me. “I should not be here. This is not me. I don’t need all of this power. I should be at home with my Mum and Dad. I force myself to drop the staff and run as fast as I can until I get home. When I get there I see it is too late. My parents have become part of the darkness. Their faces and bodies are completely black and their eyes are glowing red. The darkness must have come. They must not have screamed in fear. The darkness took them too. “No, what have I done! I never wanted this to happen! All I wanted was to not be scared anymore. I just don’t want to cry, I want to be happy”. Then I cry. “There is a way to change this you know,” a voice says. I turn around and there — hiding in the dark — is the biggest monster of them all. “You fight me and win, and everything will go back to normal and if you lose it will stay the same forever,” the dark says. It walks around me, brushing my hair in its long ghostly fingers. “So what will you do? You know you’re happy like this, “the darkness whispers in my ear. “I want it to go away. You have to let everyone I captured go right now,” I say. Regret fills me up inside. “Yeah I have one question. Why does everyone have their own darkness? And why does it follow them everywhere?” I ask trying not to sound too curious. “Well when a child is taken by a monster that lives under their bed, they then become a monster and get given a child to scare. They follow them around so that if the kid goes into the dark the monster strikes,” it says as it walks around the graves rubbing its fingers over the stones. We look into each other’s eyes. I see something past the glowing redness, something strange; the face of the darkness look like someone I know. Someone I love. I take a step closer. “Sam is it you? Are you the darkness too?” I say as the tears roll down my face again. It’s my little brother who disappeared so long ago. “Lila help me please,” he says, imploringly, “I don’t want to be in the dark anymore, please get me out” He cries, and the more he cries, the smaller the monster gets. Soon, his small, weak, defenceless body lies on the ground and shivers. “Sam, Sam! Are you okay? Hey, can you hear me?” I say whispering into his ear. I try to push him off of me, but he is determined to make me lose so that the world would stay in eternal darkness. We fight for what feels like hours on end, but was probably no more than several exhausting minutes. I manage to push him until he falls and hits his head on a gravestone. His cold half-lifeless body lies on the ground. He lies they still and silent. The darkness in him is gone. For now at least. I scoop him up in my arms and carry him off to the hospital. I look around to see I am being followed by the darkness. They are all walking around me, their long, giant, black ghostly legs and bodies walking into buildings and coming out the other side. As I cry, the monster turns its head to me and a sorry look crosses its face. It roars at me, before disappearing into the cold dark rainy night filled with others that lurk around every corner of every street. I get home to find my Mum and Dad lying on the floor. They’re back to normal. “Mummy, Daddy.” I cry as I hold them close. I can fell they their soft warm breath against my face as I hug them tight. “Hey monkey,” Dad whispers. Sometimes I wonder if he even knows my name or if he only knows me as monkey. I should tell them about Sam. Instead I fall I sleep. I wake and realize I am still on the floor curled up to my Mum and Dad and my dog Bear, who was licking my cheek. “Hey sweetie are you okay?” Mum says softly. “I am fine dear,” she says as she kisses my forehead. She tells me the news I already know and we cry. Happy tears this time. “I love you guys,” I say as I get up off the floor. I want to tell them about Sam but the words don’t come. How do I explain it anyway? Their son was some kind of evil demon all this time? I go and have a shower and as the steam from the hot water fogs up the glass, I see the words ‘I am sorry’ appear. “Hello, is someone here” I ask. ‘Everything that has happened is my fault’ appears in the steam. “That’s nice but can you get out, I have no clothes on,” I say. They write ‘sorry’ again and I hear footsteps, then the door open and closes. I start to wonder if that was the leader — the one in charge of the darkness — that I talked to while I was in the shower. “We are so sorry about yesterday, please forgive us,” they all say at the exact same time. “Did you guys rehearse that?” I ask. They all nod and we giggle, then I tell them everything that had happened — without my lips being sewn shut. Then we all walk to class. Half-way through the day, I am pulled out of school by my parents who take me to the hospital to see my brother. The hospital told them he’d turned up, but no one could tell them how or why. Maybe that’s for the best. On the way there, they tell me of how they thought he was dead. Then they tell me stories about us playing together when we were younger. As soon as my parent step back into the room, he’s back to his old, sweet self. I feel bad, but I wonder if the world would be safer if he hadn’t survived. Back at home that evening I manage to fall into an exhausted sleep. It lasts for about three hours, until I hear my door creek. “What do you want now,” I say, as I squint into the darkness. I see glowing eyes and the shape of a familiar face. I look down at the house to see all the lights turn on and people start to look out of their windows screaming. That was the last of me anyone ever saw. Well now you now know. I hide in the darkness and strike when no one even sees me coming. Wow, what a fast-paced ride. This book grabs you by the (eye)balls and drags you kicking and screaming right to the end. You’ll scream at the end because it’s finished and you’ll want to read more. 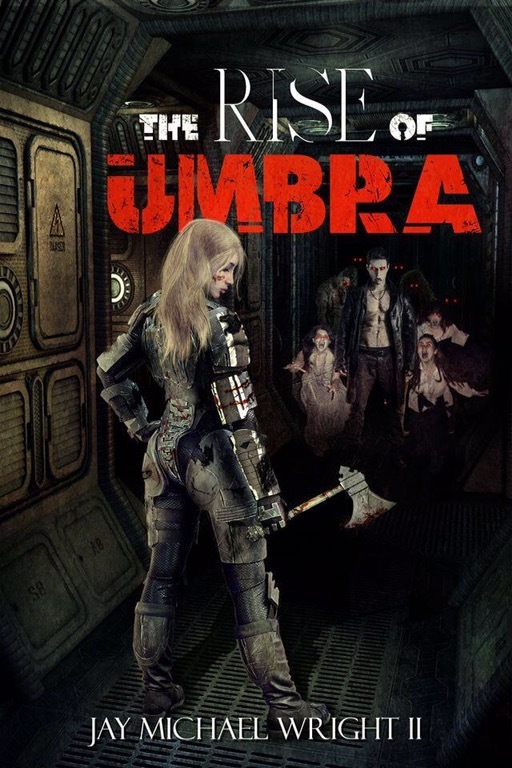 The Rise of Umbra is about a group,of criminals sent to Mars on a suicide mission. What could go wrong? Pretty much everything! If you love Killjoys, Dark Matter and Firefly, you’ll love this. It reads like an episode of any of these shows. Wright is an author to watch.